Chances are, brushing your teeth is so second nature that you do it without even thinking. But many are surprised to learn that they aren’t actually brushing properly. For example, could you answer the following questions? Is there such thing as over-brushing? How long does it take to properly brush? What’s the proper brushing technique? Should I brush right after eating or drinking? Your smile and oral health are our Yuba City dentists’ top priority. Proper brushing is one of the most important things you can do to have a healthy mouth. Let’s take a moment to review why we brush and some of the basics of good toothbrushing. We brush our teeth to remove plaque – the sticky, bacteria-filled biofilm that builds on teeth. Plaque is the natural enemy of our teeth; It contains acid-producing bacteria that erode tooth enamel. Plaque leads to tooth decay and other serious problems, like gum disease and bad breath. Estimates place plaque accumulation as the primary cause for over 90% of dental disease. Additionally, brushing with fluoride toothpaste strengthens your tooth enamel and makes teeth more resistant to decay. Not to mention that your mouth will feel cleaner and your breath fresher – who doesn’t want that? 1. Use the right brush. Toothbrushes come in different sizes. Straining to get your brush in your mouth means it is probably too big. Additionally, there are a variety of toothbrush shapes — choose one that feels good in your mouth and hand, and you’ll be more motivated to use it. Finally, always use a soft bristle toothbrush. Should you use an electric or a manual toothbrush? It’s really up to you, but electric toothbrushes can make the job easier. Speak to the Yuba City Dentistry group at your next appointment and we can help you make the decision that’s right for you. You should brush your teeth at least twice a day; three times a day is even better. Brushing more could wear down tooth enamel and damage your gums. How long should you brush? Proper brushing takes at least two minutes, longer than most adults spend. Try dividing your mouth into four sections of 30 seconds each. You can use a stopwatch to help you get the right feel. Some watch TV or listen to music while brushing to help pass the time; just make sure you don’t brush too long – or you’ll end up with sore gums. 3. Know when to wait. Energy drinks, sodas, coffee – even healthy drinks like fruit juice – contain acid that softens tooth enamel. Brushing immediately after drinking these beverages can wear away your tooth’s valuable protective coating. If you drink any one of the above, wait at least half an hour before brushing. This will give your saliva time to restore the enamel. Rinsing your mouth out with water or chewing sugarless gum in the meantime is also helpful. Make sure to always rinse your brush — germs from your mouth and teeth may stay on it otherwise. Rinsing also removes leftover toothpaste that hardens bristles. No need for any special disinfectants – just rinse your brush and let it air dry. And don’t put it in a case where it will stay damp – a moist brush is more likely to grow bacteria. The only exception might be if you use a UV toothbrush sanitizer. 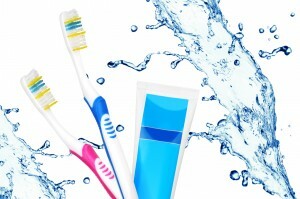 Grasp your toothbrush gently with your fingers and squeeze a pea-sized dab of fluoride toothpaste onto the brush. Gently brush the outside and inside of each tooth using short back-and-forth strokes. (If you prefer, you can also use a circular motion.) Start with the outer surfaces of your upper teeth, and then move to the lower teeth. Make sure to also clean the spaces between your teeth. Next, clean the inner surfaces of the upper teeth, followed again by the lower. Now brush the chewing surfaces. Hold the bristles flat against the molars and clean your back teeth. Do this also for the top and bottom teeth. For fresher breath and to remove bacteria, gently brush your tongue. You can even purchase a tongue scraper, a tool designed for cleaning your tongue. Check your work by running your tongue over your teeth. Do they feel slick and smooth? Good job – your teeth are clean! When should you change your toothbrush? 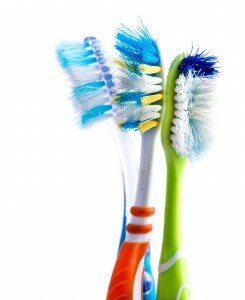 The ADA (American Dental Association) suggests getting a new brush every three to four months. In addition, pay attention to your bristles. Frayed or broken bristles don’t do as good a job at cleaning. Neither do bristles which have lost their normal flexibility. Do you have more questions regarding the proper toothbrush and whether you are brushing properly? Make an appointment with your Yuba City dentist today by calling 530-671-4784 and we’ll be happy to answer. You may also stop by our office at 1052 Live Oak Boulevard or contact us through our website.